GameIntel has long been the authority when it comes online poker traffic and liquidity. We offer various types of publications for the online game industry. We also offer standard and bespoke reports that give you the flexibility to choose the data and delivery method most useful to you. Delivered straight to your inbox twice a week, the Poker Update is more than just a newsletter. It's packed with analysis to keep you up to speed on the fast-moving online poker industry. Now includes a free Poker Industry PRO membership! Subscribe now and get free access to Poker Industry PRO premium news and data! With more than 40 pages of data, charts and analysis, this is more than just a complete history of online poker. It's a user manual for running a successful poker site. Learn why some operators have soared while others fell quietly by the wayside. A must-read for anyone who wants to understand industry trends and events in context. With Poker Industry PRO, create your own customized charts powered by GameIntel's industry-leading data. You also get access to Pokerfuse premium news and analysis available only to subscribers. Poker Industry PRO is the industry-leading news and analysis service from online poker experts. Every day industry insiders use Poker Industry PRO to keep up to date with the online poker industry. Click here to learn more and sign up for Poker Industry PRO today! Casual players are a critical part of the online poker ecosystem. Operators pour enormous resources into recruiting and retaining these players, but still their attrition rate is extremely high. The reasons why have been poorly understood. Until now. With a billion-hand database and patent-pending algorithms, Skill in Games presents critical insights into just how important the player's first experience on the site is, what causes them to leave soon after joining, and what can be done to convince them to stay. 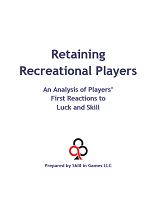 If your job involves player retention or CRM, you need this report. Click here to download the report preview. If you’ve been watching the US market as we have, you know that federal regulation of online poker seems out of reach. Meanwhile more states are moving ahead with their own legislation. State-by-state seems to be the only way forward for online poker operators to break into this lucrative market. With that in mind, GameIntel teamed up with consulting firm Academicon to create state-level projections of market size under different scenarios (with or without interstate compacts and/or federal legislation). The analysis is based on an extensive player study we conducted at the peak of the market, before Black Friday. We tracked all ring game players for six months at multiple operators, noting the players’ locations, the games and stakes they played and their playing frequency. The result gives us unique insight into the size and potential of the American market, and how the US compares to other markets around the world. All of that information is packed into this set of reports. Click here to see the summary and contents of our full US report (included when you purchase the full set of state reports). We collect detailed online poker traffic data around the clock, and we have historical data on some sites dating back to 2006. We offer not only historical reports but ongoing subscription updates. The scope and content of the report is yours to choose. The choices are truly limitless. Business intelligence is critical in this competitive industry. Keep an eye on your competitors and see how your games stack up! Here are some examples of various reports we can prepare. If you don't see what you're looking for, we'll be happy to create a report that meets your requirements. Note: Some samples contain fabricated data. How do I order one of your publications or reports? 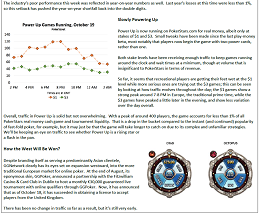 How can I find out more about the GameIntel Poker Update newsletter? How much does a subscription to the GameIntel Poker Update cost? How were your state-by-state US market projections made? How do I order one of your reports? What kind of data can I buy from you? Where are the prices? How much will it cost? How soon can I get my report? Can you deliver Excel spreadsheets? Can you deliver my data as XML? Can I get regular updates for my report? Can I get a data feed from you? If I get a report subscription, can I get historical data to go with it? 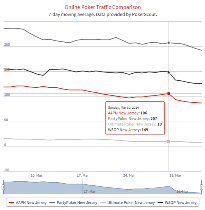 Can I get data from you to put a traffic report on my website? Are there limitations or restrictions on how I can use your data? Ordering is easy. Just send us an email to get started. We'll be happy to help with your order. How can I find out more about the GameIntel Poker Update? 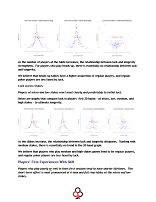 Contact us for more information and a sample edition of the GameIntel Poker Update. The GameIntel Poker Update is intended mainly for the professional whose business is tied to the online poker industry. Contact us for subscription rates. In late 2009 and early 2010, we tracked players at several of the largest poker sites, including PokerStars and Full Tilt Poker. At that time (before Black Friday), those two sites alone had a worldwide market share of nearly 60%. We tracked all real money ring game players on each site every 10-15 minutes, and we did this for six months. For each player, we noted the game type and stakes they were playing (at multiple tables if applicable) as well as their location. 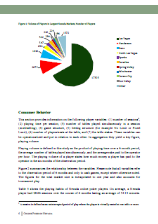 This gave us a very detailed look at the playing habits of players from different countries and states. 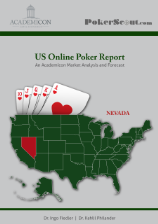 Using this data, the wizards of consulting firm Academicon applied economic forecasting models to project the size of the online poker market in each state. Results were calculated for three scenarios: Each state in isolation with no cooperation, limited interstate compacts, and a federal or international framework. We can create a report to answer almost any question you may have about online poker ring game traffic and players. We perform a detailed count of the number of ring game players by game type and limit at each poker site every 10-15 minutes. This adds up to a large amount of data which can be summarized and presented in many different ways. Our reports are generally custom-made to meet your requirements. A simple report might consist of the daily peak or average player counts at various poker sites. (For purposes of financial and competitive analysis, many of our customers find the average player counts to be more useful than the peaks.) We also have much more detailed data available as shown in the sample reports and publications above. Contact us with the question you are trying to answer, or the analysis you would like to perform, and we will do everything we can to help. Pricing generally depends on the scope and detail of the report, the number of sites included, the time frame covered and whether you are looking for historical or subscription reports. Unfortunately we can't cover all of the possibilities here, but as a general guideline, the cost for historical reports often falls in the range of $200 to $3,000. Contact us about the report you are interested in and we'll be happy to give you a specific price quote. Historical reports can often be delivered within 2-3 days of payment. Rush deliveries are available on request at additional cost. Historical reports are delivered as Excel spreadsheets unless another format is requested. Various methods of delivery are available for subscription reports, including XML feed. Yes, we can deliver reports as Excel spreadsheets. Yes, we can generate XML to make importing the data easier. Yes, you can sign up for a subscription to get regular updates for your report. Yes, subscription data can be delivered by XML feed on request. Yes, just ask for a package price for historical data plus a subscription. 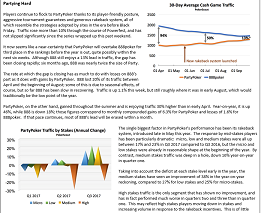 PokerScout.com is the exclusive public outlet for GameIntel data. Unfortunately we cannot make our data available to other websites. We perform a detailed count of the number of players by game type and limit at each poker site every 10-15 minutes. In some cases the data is provided to us directly from the site or network, and in other cases we collect it from the operator's publicly available poker software. Our reports are strictly for private use by the purchaser, not for republication or distribution. If you would like to purchase data for some purpose other than your own private use, please let us know.